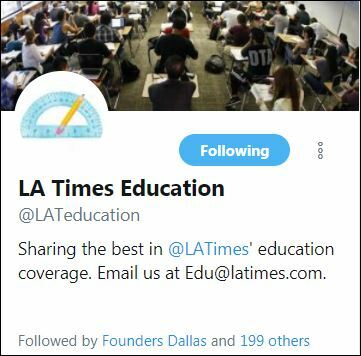 Though few outside of the education world and Los Angeles may have noticed, two big things have happened at the LA Times in recent months. After years of budget cuts and buyouts, the paper has been bought by a local businessman who seems interested in restoring the paper to a previous era when the paper dominated the region and regularly competed with national outlets. At the end of June, education reporter Joy Resmovits left to become an assistant metro editor at the Seattle Times overseeing the education team. These circumstances create an excellent opportunity for the LA Times to reinvent its education coverage, with the goal of reinvigorating its work and making it among the best in the nation. The need is clear. In terms of juicy stories, LA has it all: immigrant and refugee students, a possible strike, innovative programs, looming financial problems, an elected school board. But from where I sit, the need for the LA Times to try some bold new ideas is clear. The LA Times is not alone in needing to rethink its coverage. The challenges and opportunities are similar to those faced by local and regional news outlets in other parts of the country. First and foremost, the paper needs to reinvigorate its local education coverage. It might be tempting to focus on broader state and national issues, but that’s what the Washington Post did. In the process, the Post missed a series of scandals in the DC public school system. The good thing is that the current education team – reporters Anna Phillips, Sonali Kohli, Teresa Watanabe, and Howard Blume – is experienced and savvy. But the coverage area is massive, and Blume says the education team is regularly called on to work other beats. Four not-quite-full-time education reporters isn’t really enough to do the job right, even by today’s diminished standards. If there is room in the budget to add another local reporter, who should that be? My first pick would be The Oregonian’s Bethany Barnes, who’s produced an enormous amount of compelling investigative journalism in the past few years. Or, the paper could try to poach Kyle Stokes from local public radio station KPCC, where he’s produced excellent work that made him a 2016 EWA awards finalist for broadcast beat reporting. Current and recently-departed LA Times education journalists, clockwise from top left: Joy Resmovits (now at the Seattle Times), section editor Nita Lelyveld, higher education reporter Teresa Watanabe, investigative reporter Anna Phillips, reporter Sonali Kohli, and reporter Howard Blume. Regardless of who’s doing the work or how many reporters are assigned to the beat, a major challenge the paper and the section have to address is how to deal with breaking news. It’s difficult for beat teams not to fritter away all their time and staff resources on breaking news stories and high-interest but low-importance disputes. This is one of the most common challenges for beat teams in big cities in an era of diminished resources and social media. To address the challenge, the paper might consider the model being implemented with some success at WBEZ, Chicago’s public radio station. In essence, WBEZ has decided not to try to cover every education-related event and announcement, leaving that to other outlets so that its beat team can do high-quality, in-depth work. Another option would be to reconfigure the team so that one reporter is in charge of breaking news and digital content. (More about this approach below.) A reduction in breaking news coverage would allow reporters to do more feature and enterprise journalism and give reporters time to focus on innovative storytelling. It’s no easy task to figure out the right balance, but tough choices need to be made. There are so many promising strategies for improvement that the paper could borrow from other outlets and beats: Host a series of events. Launch a newsletter. Ask teachers, students, and parents what they think (or want to know about) and report on their most common concerns. Announce a thematic focus for the team’s coverage and link stories together over time. Create a high-quality podcast. However, key to any innovation must be improving how the paper tells education stories and picks the stories it chooses to tell. The past few years have highlighted the importance of storytelling to make news more accessible and compelling for everyday readers. Being the second-largest school district in the nation doesn’t necessarily mean readers want to pay attention. One move to consider would be to hire a story editor to help ensure that well-reported pieces don’t fall flat. Good storytelling on LA schools’ challenges educating half a million children will keep a reader coming back for more. In addition, the paper should reconsider its focus on covering conflict and politics. The paper does reasonably well covering the endless disputes between the teachers’ union and school reform advocates who favor choice and accountability. But education in Los Angeles is so much more than that. And the focus on political coverage “makes it difficult for the public to understand the larger issues facing schools related to the challenges of educating over half a million children,” says UCLA’s Noguera. Last but not least, the paper needs to find someone exceptionally good to replace the talented Resmovits. While she seemed mis- and under-used at times, her role was an important one. Whether the topic is implementing restorative justice or educating unaccompanied children, connecting what’s going on in Los Angeles to the rest of the state and nation – and vice versa – is a crucial role. Who then should get considered? My first thought would be to try to poach Jenny Medina from the NYT’s West Coast bureau. She has written about education. She knows Los Angeles well. More importantly, Medina knows how to tell a local story that has national appeal. Another strong candidate would be freelancer Rob Kuznia, who won a Pulitzer in 2014 for his investigation about corruption in a Southern California school district. No matter what, the paper should not leave that spot unfilled. “It would be great to be able to do more state and national education reporting,” says Blume about what he’d like the section to be able to do. There are a few additional suggestions the paper would do well to follow, like hiring a dedicated digital engagement editor or even an old-school blogger in order to keep the conversation going, bringing back a weekly education column to help connect the dots between stories and give readers the big picture, and fixing the website, which is a discombobulated mess that forces folks like me to resort to Google to find things on the site. But the core are the suggestions listed above: focusing on local coverage, innovating how the section tells stories and decides what stories to report, breaking out of the breaking news cycle, and bringing in great reporters to help accomplish ambitious goals. Some of these changes are easier to implement than others and yes, most of them would cost money. And not every addition or innovation is guaranteed to succeed. But leaving the education coverage as it currently is – under-staffed, unfocused, and isolated from the discussion – would be a shame. The Los Angeles Unified School District is too important a district to be ignored, and the LA Times is too strong a paper not to bring powerful stories to the region, the rest of the state, and the nation. I, for one, am crossing my fingers that the paper figures out some promising ways to take its education coverage to the next level. Note: Thanks to Kristen Doerer for stepping in and editing this column, filling in for editor Karin Klein.